During the summer, your utility bills often increase from using more air conditioning and water. There are several low-cost ways to make your home energy efficient. Some of them are lifestyle changes or replacing fixtures. Keeping your home well maintained always helps too. Read on for our tips on how to make your home energy efficient. Be wise when choosing your lighting. When you are replacing light bulbs, use LEDs. LED bulbs use a different technology than the traditional incandescent light bulbs, and because of this, they use far less energy to operate. These bulbs also last a very long time. Tests have shown them to last anywhere from 20,000 up to 50,000 hours. 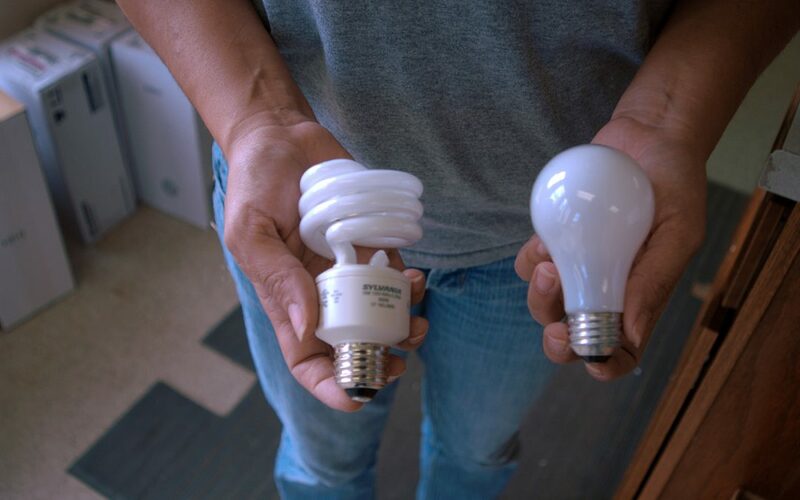 LED light bulbs can be purchased at most variety or hardware stores. Of course, turn off all lights when not in use. Make your home energy efficient by monitoring faucets for leaks. A leaking faucet wastes water, and if left unattended, it could eventually lead to more significant and more expensive repairs. Often you do not need to purchase an entirely new faucet. Most of the time the faucet seat washers can be replaced and this will solve the problem. Some lifestyle changes that will help save water are taking shorter showers. Begin by tracking each person’s shower time then try to reduce it by three minutes. For example, a family of four could reduce their total shower time by about 12 minutes. Twelve minutes a day over an entire year is a lot of water. Whenever possible, use cold water to rinse the laundry. If you are in the market for a new clothes washer, look for the Energy Star rating. Appliances with Energy Star ratings have been tested and proven to save energy while still performing efficiently. Changing or cleaning air conditioning air filters regularly will help keep your unit operating the most efficiently. Use ceiling fans to circulate air. In the summer, set your fan to run counterclockwise. Pull blinds and shades to block the sun in the summer. Make sure the doors and windows have adequate weather stripping. Applying weather stripping can be an inexpensive DIY project that will help your home stay cooler in the summer and warmer in the winter. These tips cost little to implement yet will save you money over time. Make your home energy efficient by maintaining the systems you have, and when it is time to upgrade or replace them, look for the Energy Star rating or newer, more efficient technology. Kelleher Home Inspections provides home and commercial inspection services to Greater Las Vegas including thermal imaging, which can detect areas of energy loss. Contact us for a home inspection and take steps to make your home energy efficient.